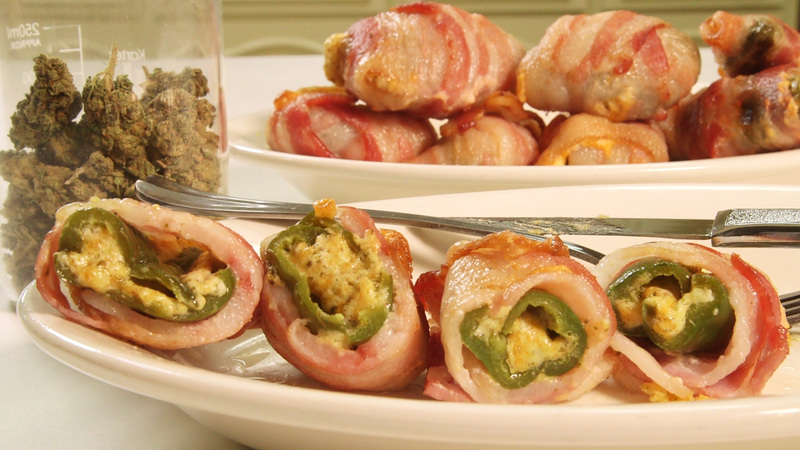 Cannabis Infused Jalapeno Poppers with chive, cheddar, cream cheese and bacon are a fresh and spicy summertime recipe. De-stem, grind and add the cannabis into an oven safe dish. Cover and decarb in oven set to 250° F for 25 minutes. Combine olive oil with decarbed cannabis and Infuse in oven for 2 hours still at 250° F.
In a food processor combine infused oil and cannabis into hopper. (NOTE: If using rosin chips strain the oil from the cannabis chips and use only the oil.) Add in chive and pulse a few times. Add in the cream cheese ⅓ at a time pulsing between each addition. Remove from processor and fold in cheddar cheese. Set filling mixture covered in refrigerator and continue. Cut the stem and slice each jalapeno lengthwise. Remove seed and guts of the pepper to leave a clean cavity. Keep pepper halves together and set aside. Spread each half of each pepper generously with the cheese filling then pressing them together. Then wrap each one in bacon and secure with a toothpick if needed. Lay them out on greased baking sheet with a drip pan about 1 - 2 inches apart. Bake at 425° F for 20 - 25 minutes, let cool and enjoy.